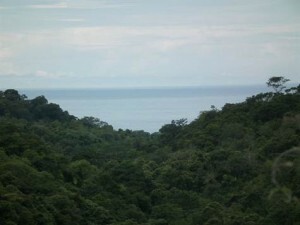 This is a beautiful 45 acre farm located 20 min from the center of Uvita. This property has it all. It has nice ocean views, great views of the San Luis Waterfall from everywhere on the farm, 1 km of river frontage, and tons of open usable land. The river is spectacular and has tons of swimming holes and cascades and is blanketed by jungle on both sides. The lower section of the farm has several nice building sites and open pasture perfect for animals or for reforestation and gardening. The upper part of the farm also has many buildable areas and excellent soil where the owners are growing lots of corn and rice. One of the nice things about this farm is the easy access to the river. No matter which section you build on it is a short easy walk down and there are countless places to swim. The road that the farm is on also goes over the mountain to San Isidro and is in very good condition. You can get to the city in aprox 45 min. There is a great mix of Tico and foreign neighbors close by so even though it is remote and private there is a growing community. Farms this nice are hard to find!! !